Set on Cape Ann in the early 1800s, The Last Days of Dogtown is peopled by widows, orphans, spinsters, scoundrels, whores, free Africans, and 'witches.' Among the inhabitants of Dogtown is Black Ruth, an African woman who dresses as a man and works as a stone mason; Mrs. Stanley, an imperious madam whose grandson, Sammy, comes of age in her rural brothel; Oliver Younger, who survives a miserable childhood at the hands of a very strange aunt; and Cornelius Finson, a freed slave whose race denies him everything. At the center of it all is Judy Rhines, a fiercely independent soul, deeply lonely, who nonetheless builds a life for herself and inspires those around her to become more generous and tolerant themselves. This is a story of hardship and resilience -- and an extraordinary re-creation of an untold chapter of early American life. With a keen ear for language and profound compassion for her characters, Diamant has created her most moving and powerful story. I guess I'm never going to find another Anita Diamant that I enjoy as much as The Red Tent, but this one was better than Good Harbor. I enjoyed the characters and a bit of New England history. I often have trouble keeping characters straight in books with so many. I find myself wondering, "Who was this again?" But, not with The last Days of Dogtown!! The characters are so full, so vivid, so unique, that they stay with you. (The wonderful narrator helped too!) I loved the way Anita Diamant interwove their lives, and even though a particular episode featured another of Dogtown's inhabitants, suddenly an "old friend" introduced previously will slide into it - marvellously and very cleverly written! Definitely a keeper! This was my first "audio" book and I really enjoyed it. The story was interesting and kept my attention until the end. The character development was very good and as the story evolved, the author draws you in so that you become concerned and even attached to the individual characters. The narrator was engaging and I look forward to another selection with the same narrator. This book hit the ground running. Characters were developed well and each had a definitely different personality. The auther left no question of what each character was about. Especially effective was the narrator. An outstanding interpretation of each character. Serious where it was required and able to interpret the dialog well when humor was to be accented. I first read Anita Diamant's book "The Red Tent" which instantly became one of my top 5 books ever.... So I was anxious to dive into another of her books. This book doesn't disappoint! And the narrator truly made the story come to life. Highly recommend this book. This book should be added to your list, but you will need to get through at least 1 CD before you are hooked. It takes one hour to connect with the rhythm of the narrator and to engage with the chronology of the story. By the end of the book you will feel like you are a member of the Dogtown family and you have just taken a nostalgic journey into the past with all of the favorite family stories, folklore, and legends being retold by a wonderful story teller. You will experience many emotions along the way. I remembered why it is so important to recount all of those people who, even though lost to me now, have shaped me with their impact on my life. I can only say that the author, Ms Diamant, has a storytelling quality that keeps you pinned to this book. I am fascinated by her command of the language and the fluid flow of the story. I am looking forward to listening to more of her books on my long commute to work. I enjoyed this book but thought a little more could have been made out of the ending. 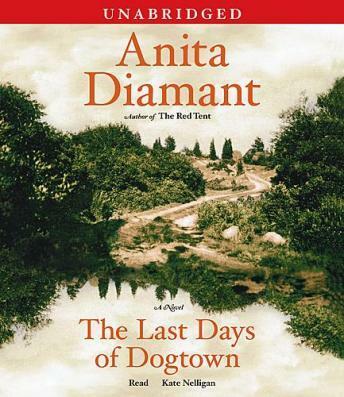 However, Diamant made me feel so familiar with Dogtown and its residents that I didn't want the book or the community to come to an end. But given the title, it was apparent what would happen. I most appreciated the glimpse into the past and the fact that Dogtown apparently is or was a real place. The characters were interesting, and each had his or her own reason for remaining in Dogtown or leaving it. I thought The Red Tent was better, but this one was great too. A little slow to start with and a little confusing, however it didn't take long to start identifying the different characters and feeling vested in how they developed in the book. So a thumbs up for me!